BURLEY, June...passed away peacefully at Trenton Memorial Hospital on Friday, January 25th, 2019 at the age of 79. Cherished mother of Stephen Burley, Kimberly Gregg, Sheri Ellis & her husband Darrin, and the late Trina (surviving Bruce) O'Hara. Proud Nanny of Shannon & Adam Burley, Michael Baker, Amanda Wood, Ryan & Tyler Covell, Kristina Bain, Colton Ellis and 13 great grandchildren, 1 great-great grandchild and another on the way. Cherished sister of Glenelda Peirce, Larry Kendell, Beverley Money, Sandra Hemstock, Jean Jaynes and the late Garth & John Bowler. June's wishes were for cremation to take place and a celebration to honor her life will be held at a later date. 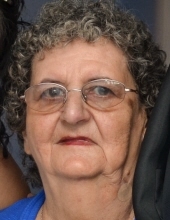 Interment of her urn will take place at Stockdale Cemetery. If desired, memorial donations to the Canadian Cancer Society or the Heart and Stroke Foundation would be appreciated. "Email Address" would like to share the life celebration of June Ann Burley. Click on the "link" to go to share a favorite memory or leave a condolence message for the family.